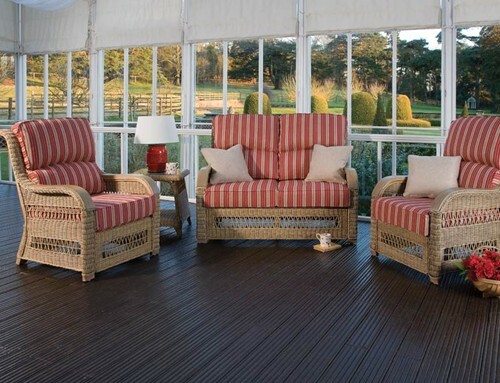 The Maldives range is a modern meets traditional suite, featuring solid wood arms surrounded by a hand woven rattan cover, hiding a solid hard wood frame and webbed bases. The cushions incorporate a split back, comprising of separate lumber and headrest support, to ensure maximum comfort and support. Shown with Sills Tomato fabric. Ocean Designs operates a 2 tier fabric system. Standard Grade is the cheapest fabric and is usually 100% cotton. Premium Grade is more expensive fabric and is more hardwearing. All of the fabrics are removable and can be dry cleaned. Ocean Designs offers a 2 year structural guarantee on all of its frames. For more information click HERE.